Time for a trip to find Sasquatch! Bunch of you remember this run. We’ll be hitting the awesome trails of the Rachel Carson Conservation Park including a quick visit and group photo op at Sasquatch Cave. Yes, you read this right…the one and only Sasquatch. Little known fact that he lives here in MoCo in a cave…or at least he rents out a cave some parts of the year (Cave B&B?). We always start out this run by scooting over to this secret (shh) location to see if he is there and take a group snapshot to prove we were there. We do this run every year and he hasn’t eaten anyone yet. Even Sasquatch thinks trailies smell a little off, I guess! After the pic we cruise around on the various loops at this GREAT trail venue until we get our miles in. Easy-peazy! Course: Lots of intersecting loops…you pick! Distance: As little or as much as you like. All paces welcome! 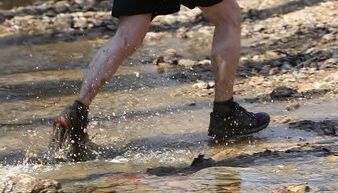 *** Look for info on the Muddy Shoes Summer Trail Program. Starts in May sometime after the Farm Park Challenge. Goal race is the MD HEAT 25/50K in August. *** Last thing – Make sure you stay fashionable on the trails. I got Muddy Shoes hats ($15), Buffs ($10) and magnets and stickers ($1 each) for sale. OK, C U Bigfoot Paparazzi there!